We love Philips Hue just as much as anyone else, but it you’re not planning to go all-out on your smart lighting setup then there are a bunch of good options that cost much less money. 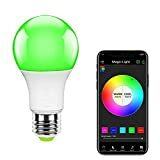 For example, if you’re just looking for a few color light bulbs that you can control with Alexa or Google Assistant, check out the MagicLight WiFi Smart Light Bulb. It supports thousands of hues and can be controlled with an app or your voice, and it only costs $18 on Amazon.